NASA’s Solar Dynamics Observatory captured this image of an M5.6 solar flare (visible in the lower-center region of the sun) on Aug. 24, 2015. The sun fired off a midlevel solar flare early this morning (Aug. 24) while a NASA satellite watched. 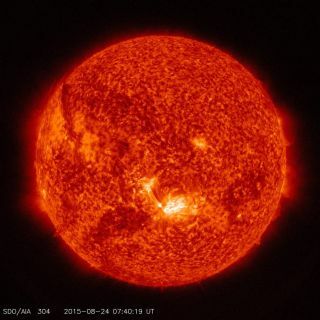 The space agency's Solar Dynamics Observatory (SDO) captured an image of the flare, which erupted at 3:33 a.m. EDT (0733 GMT) this morning from an Earth-facing sunspot known as Active Region 2403. Solar flares are bursts of high-energy radiation that cannot get through Earth's atmosphere to affect people on the ground. However, extremely powerful flares can have impacts higher up, triggering temporary radio blackouts and radiation storms that could endanger orbiting astronauts. Flares are often accompanied by explosions of superheated solar plasma called coronal mass ejections (CMEs). Potent CMEs that hit Earth can spawn geomagnetic storms powerful enough to disrupt radio signals, GPS communications and power grids. CMEs also often supercharge the beautiful auroral displays known as the northern and southern lights. It's unclear at the moment if this morning's eruption produced a CME, said researchers with the Space Weather Prediction Center (SWPC), which is run by the United States' National Oceanic and Atmospheric Administration. SWPC scientists said they'll know more after they analyze data from the Solar and Heliospheric Observatory (SOHO), a sun-studying spacecraft operated jointly by NASA and the European Space Agency. "Although this flare is bigger than we have seen in some time, it was very impulsive and lacked typical radio signatures that are often associated with CMEs," SWPC researchers wrote in an update today. "We will update as additional data becomes available." Skywatchers were treated to enhanced auroras over the weekend, thanks to a stream of solar particles, and more sky shows could be in the offiing. Two small CMEs that erupted several days ago could hit the planet today, SWPC scientists said. Editor's note: If you capture a photo of stunning auroras in the night sky from recent solar activity and would like to share them with Space.com, send images and comments in to managing editor Tariq Malik at: spacephotos@space.com.